Adults generally over 50 years of age suffer from diverticulitis, which is defined as inflammation of the colon walls due to infection. Diverticulitis is characterized by tiny intestinal pockets wherein the stool gets trapped resulting in infection. Diet low in fiber content is considered to be the chief Diverticulitis cause. Antibiotics can cure the condition but a change in dietary habits can bring easy relief. Certain foods are considered to trigger diverticulitis. Here is a list of foods that must be avoided to prevent Diverticulitis. Sesame seeds, pumpkin seeds and sunflower seeds are believed to cause irritation to the colon wall. Nuts are also believed to cause such irritation. This is because of the tiny size of these nuts and seeds that can get into intestinal pockets. However, there is no scientific proof for the same. Anything spicy results in rectal discomfort and inhibits smooth bowel movement. This would result in greater pressure on the intestines and hence the colon walls would become weak. People should avoid spicy Indian cuisine and Thai cuisine in such a case. One should also avoid chili peppers. People with diverticulitis should avoid corn and corn products such as tortillas, popcorn, corn flour, etc. Raw vegetables including Iceberg lettuce and cabbage are also believed to cause infection to the colon wall and lead to the development of diverticula. People with diverticulitis should also avoid tomato juice. One should also avoid onions to keep diverticulitis at bay. Pulp of fruits should also be avoided. 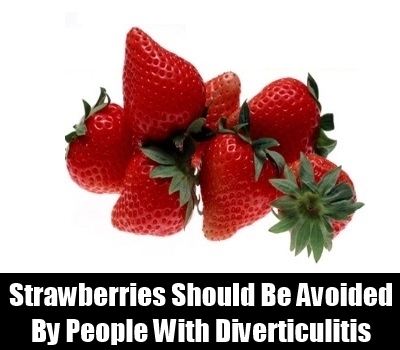 Strawberries and blackberries should be avoided by people with diverticulitis. Food with high fat content could trigger diverticulitis. In addition, fried foods are also considered to trigger diverticulitis. Food items such as beer, soft drinks, etc. can result in diverticulitis. Such food items have zero fiber content and hence affect the digestion process adversely thereby causing increased pressure over the colon walls. There are some other foods such as peas, beans, etc. that are closely associated with weakening of colon walls and hence diverticulitis. In addition, people should keep all kinds of stress at bay. Stress affects the digestion process adversely. Stress inhibits the free flow of oxygen and blood to the digestive system. Stress also weakens the natural defense system of the body. Under such a condition, the body’s natural ability to fight against colon infection is minimal and the person can easily get diverticulitis. One should rely more on high-fiber diet as it helps in bowel movement and keeps constipation at bay. Straining due to constipation exerts pressure on the colon lining and hence weakens the colon wall. This results in diverticulitis. Some high-fiber content foods are Whole-grain bread, brown rice, legumes, lentils and fruits. As soon as the symptoms of diverticulitis appear, the person should be put on a clear liquid diet comprising of see-through beverages. Also, diverticulitis patients should go for eggs, tender meat, plain pasta, mashed potatoes and other such soft foods.